This pdf clocks in at 2 pages and is a mini-dungeon. This means we get 2 pages content, including a solid map and all item/monster-stats hyperlinked and thus, absent from the pdf, with only deviations from the statblocks being noted for the GM. This one does not come with a .tif extra map, just fyi. The dreaded summoner Vlexigorn, known for the delight he takes in enslaving demons, was about to meet his match, when the kolyarut hunter Lanthanus was on his trail. Unfortunately, the summoner has managed, with the help of his vrock-aide Chor-da ta’al, to get the better of the kolyrut and use his portal to escape to Mechanus – the resulting instability has the creature on the clock (Get it? Mechanus…clock? Sorry, will hit myself for that one later…) and stranded in the material plane -he can’t return for now and in 3 hours, he’ll be banished here! The wounded outsider thus beseeches the PCs to enter the clockwork world of Mechanus and stop the vrock. Upon entering the place, the PCs will at least find the bloody remains of the summoner – which alas, means that the vrock is now free-willed. Really weird: Bypassing the gears that claimed the summoner’s life requries a Dexterity check – not a Ref-save, not an Escape Artist check…I don’t get it. The exploration of the small complex depicted here…is somewhat weird. The depictions of bellows, scrying devices and the like are flavorful…but you can’t do much with them. There is a control device for portals…and it needs a DC 28 (!!!) Intelligence check to understand. Again, weird – not Knowledge (engineering), not even Knowledge (planes) – straight Int versus DC 28. That being said, it is pretty evident why the complex, as such, isn’t that detailed or engaging – the mini-dungeon basically is a prolonged boss-fight, with relatively detailed tactics given for the vrock – which I’d generally applaud. At the same time, however, a “permanently active electrical field” is supposed to keep the vrock in line. Guess what? Vrocks are immune to electricity. he could just LEAVE. Heck, his tactics even mention him using the electricity as a shield…but not how much damage that would inflict to PCs braving the field. Another logic-bug: Vrocks can at-will greater teleport, teleport into the PC’s back, finish the kolyarut. In short – if you swallow the premise, this can be a fun module; but if you don’t and look closer…then it just makes no sense. Editing and formatting are very good, I noticed no significant glitches on a formal side. Layout adheres to a beautiful 2-column full-color standard and the pdf comes sans bookmarks, but needs none at this length. Cartography is full color and surprisingly good for such an inexpensive pdf. The pdf does sport one nice piece of original full-color art – kudos! Jonathan Ely can and has done so much better. The premise is cool; I like the gear-studded map and the adversary and his strategy is neat. The strange ability checks when you’d expect saves or skill checks are weird…but don’t weigh as highly as the stretches expects you to swallow. I can get the “immensely lucky”-angle for the portal; it’s the premise of the adventure. Strange stuff happens. However, I don’t get why the module wastes precious word-count on the back-story of an irrelevant, ostensibly high-level summoner who has no loot (WTF?) and no bearing to the plot whatsoever. The dungeon, ironically, is sterile – it has almost no interaction points and those that are here bear no relevance to the, admittedly cool boss fight….that remains cool unless you start thinking, when suddenly, it stops making any semblance of sense. The adversary’s tactics are aimless make zilch sense to me; the vrock’s not stranded, the kolyarut’s wounded, he’s free two greater teleports and we have a PC-failure on our hands. Even if you’d argue that the vrock wants to infiltrate Mechanus, it makes no sense, he’d just have to use spores, then teleport away until the timer’s elapsed. His whole motivation makes no frickin’ sense. As soon as you start questioning anything in this mini-dungeon, even tangentially, you’ll see it coming apart. I love the idea here – but the execution is extremely flawed. My final verdict will clock in at 1.5 stars, rounded up for the idea that a GM can scavenge and the nice map. Plot-wise, this is a wreck. 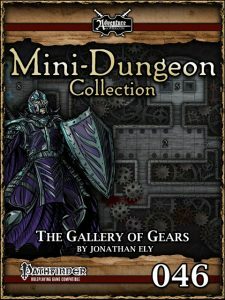 You can get this mini-dungeon here on OBS.